As I’ve mentioned in my previous spotlight post, Santucci Priore, P.L. have the privilege to represent a veritable cornucopia of clients. By far and wide, one of our most charming and talented is hip hop artist and femcee, Stichiz. Stichiz was born in Ottawa, Canada but raised right here in South Florida. Due to her Haitian heritage, she speaks English, Creole, and French fluently. Stichiz is an active member in South Florida’s community. She hosted and performed in the “Crunk City: Stay in School” tour, with a focus on finding and improving one’s passions, education, and health. From 2008 to 2011, Stichiz served as president of the NAACP’s Youth and College Division for the state of Florida and was also a Youth board member of the Martin Luther King Jr. Celebration Committee for over five years. In addition to her already impressive philanthropic resume, Stichiz is also a mentor for Women of Tomorrow and a member of Konbit Kreyol, an organization aimed at educating students about Haitian culture. Stichiz combines a variety of music genres such as Hip Hop, Rock, R&B, with a hint of Soul and Funk, coining the term, “Stichzophrenic Music” with DMX, KRS1, Da Brat, Michael Jackson, Tina Turner, and the Red Hot Chili Peppers being notable influences on her as an artist. Stichiz’s career has been on fire since her debut, having opened for Wycleaf Jean, Lil Kim, and Gucci Mane. Her top singles, “Dangerous” and “An’Ale” (a tribute to her heritage and the #1 Haitian Flag Day anthem), cemented her ranks on the Top 10 Alternative Artist and Top 3 Hip Hop Artist charts on ourstage.com. Awards and nominations include The Dream Keeper Award, voted Best Host and Best Female Lyricist in Broward County, and a NAACP Medgar Evers award nomination. Her latest endeavor is appearing on BET’s brand new show, “One Shot,” for a chance to prove her emcee skills to a panel of fellow musicians in a fierce completion. We wish Stichiz the absolute best of luck on the show and have faith that she will go far in her astounding career. 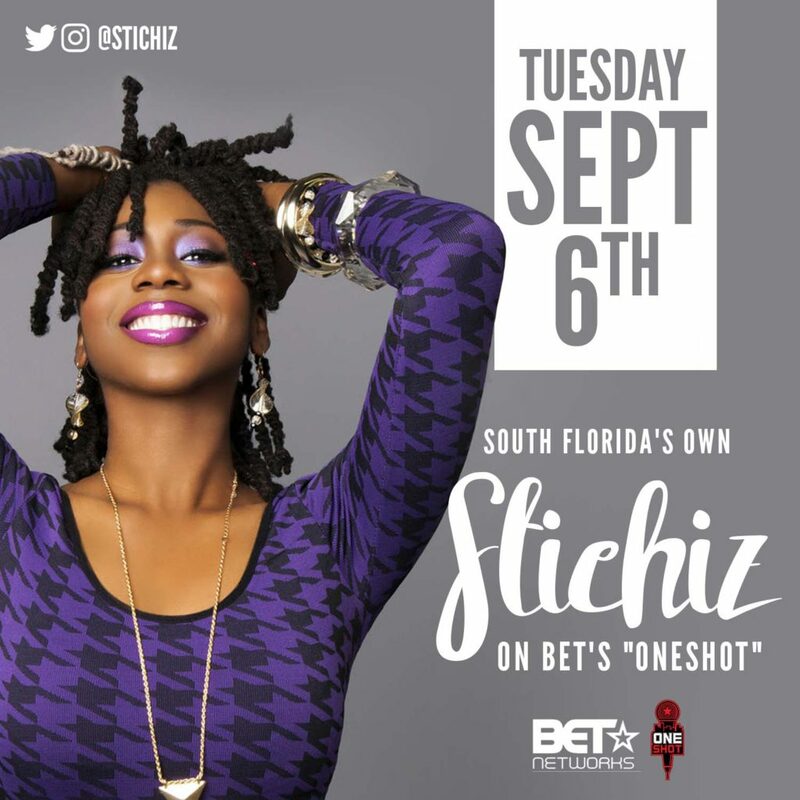 You can catch Stitchiz on BET’s “One Shot” tonight at 10pm EST by clicking HERE!